Renée Bovée from the Wyoming Cultural Trust Fund and Jenny Ingram from the Wyoming Humanities Council will offer joint grant workshops in eastern Wyoming on Monday and Tuesday, March 12-13. The sessions are free and open to the public and will include information about grant opportunities from both agencies. Participants are welcome to bring lunch to the noontime sessions. Dessert will be provided. The schedule includes: Torrington, March 12, noon, Eastern Wyoming College, Room 131; Lusk, March 12, 7 p.m., Niobrara County Library; and Newcastle, March 13, noon, Weston County Library. For more information, please contact Anne Hilton, 307.532.8286. Ten high school teams from around the state of Wyoming competed at the Wyoming Academic Challenge, hosted by Eastern Wyoming College, Saturday, February 18. The three to four-member teams participated in four rounds of competition and answered questions ranging from current events to mathematics and literature. Schools participating were: Big Horn, Campbell County, Sheridan, Cheyenne East, Evanston, Riverside, and Tongue River. First Place was Sheridan with a total of 765 points. Second place went to Big Horn with 700 points. Third place was Riverside with 575 points. Plaques and medals were presented to the winning teams and students on the first place team were presented scholarships to attend EWC for the 2012-2013 academic year. A partnership between Eastern Wyoming College and the Wyoming Youth ChalleNGe Program evolved into an effort by both schools to help the at-risk students and high school dropouts at ChalleNGe find success after graduation, said Dee Ludwig, EWC’s vice president for learning. ChalleNGe, a voluntary program for teenagers wanting to work toward a diploma, partnered with EWC in 2011 to offer advanced cadets a chance to experience college. Those initial nine cadets from ChalleNGe’s classes 11 and 12, and the bridges built during their classes, turned into a relationship which allows the community-oriented college to reach out to potential students who are learning to be community minded. “It’s a 180-degree about face from beginning to end,” said Diane McQueen, the college’s Adult Based Education Program director, of the cadets she meets. “It is absolutely what we should be doing,” said Ludwig. ChalleNGe completed the initial testing of Class 13 cadets, Jan. 25, to determine if they qualify for courses at EWC this semester. Smith said once the results are in and the students’ interests are gauged, ChalleNGe will approach the college to discuss what courses and programs are available and best meet the needs of the students. With ChalleNGe’s campus at the Camp Guernsey Joint Training Center, less than an hour from EWC’s Torrington campus, a multitude of programs and opportunities are available. “Our cadets spend a day on the college campus, and the college staff provides a great deal of information on every aspect of college life, from registration, to financial aid, to dormitory life and the classroom experience,” said Smith of the students’ introduction EWC. Cadets in classes 11 and 12 who were enrolled in the college had differing experiences. Class 11 took courses at the campus involving basic computer knowledge, improving study habits and a few technical courses. Their course options were limited due to the timing between the start of EWC’s spring semester and the start of the ChalleNGe course. Class 12 had three who enrolled in degree-seeking courses like biology, introduction to business and introduction to corrections, said Theresa Smith, recruiting, mentoring and placement coordinator for ChalleNGe. Those courses were web-based. The three cadets who enrolled in the online courses were not the only beneficiaries of the partnership with EWC. McQueen said she worked out scholarships with the Wyoming Department of Workforce Services to test cadets for the National Career Readiness Certificate. The certificate is a way to recognize the ability levels for skills job applicants possess. Ten cadets in Class 12 earned a certificate. The problem is funding. There is a cost for taking the certification course, just as there is a cost for taking the GED exam. EWC and ChalleNGe both said they are working to find scholarships and ways to help the cadets, many of whom don’t have ways to pay out of their own pockets. Smith said since he has not had a chance to speak to EWC about the specifics of the current class of cadets, he cannot speak to the scholarship requirements yet. The outreach program to ChalleNGe is also reaping benefits in continuing education. Not all cadets are able to pass the GED exam or complete their high school diplomas during the in-residence portion of the program. “Even if the kids aren’t successful getting their GEDs in the program, they’re going out and getting it from somewhere else,” McQueen said. She said she has at least one student from Class 11 enrolled in a GED program through EWC’s Lusk outreach. “We’ve seen them in welding and we’ve seen them in cosmetology,” Ludwig said of former ChalleNGe cadets who enrolled in college. She said she’s also found two former ChalleNGe-EWC students who enrolled in other Wyoming community colleges; Western Wyoming Community College, in Rock Springs, and Central Wyoming College, in Riverton. EWC also became the last place many of the cadets see as ChalleNGe cadets. The campus hosted the previous two graduations, something Ludwig said she is proud to be a part of. “There are so many tears in that audience,” Ludwig said of the reactions parents have watching their children graduate. The annual school partnership was held at EWC on January 26, 2012. This meeting allows Eastern Wyoming College to present information to all service area Superintendents, High School Principals, Counselors and EWC Outreach Coordinators. This also gives the area service personnel an opportunity to ask questions and discuss new ideas. The Workforce Development Center at Eastern Wyoming College is now accepting registrations for a CDL course to be held in Douglas. This course will begin March 26th and run through April 13th, Monday – Friday, 7 am – 5 pm at the Douglas Branch Campus located at 203 North 6th Street. This course is designed for those individuals who need a CDL license for their job or those who are seeking a job. Workforce training grants are available for individuals and businesses who qualify. 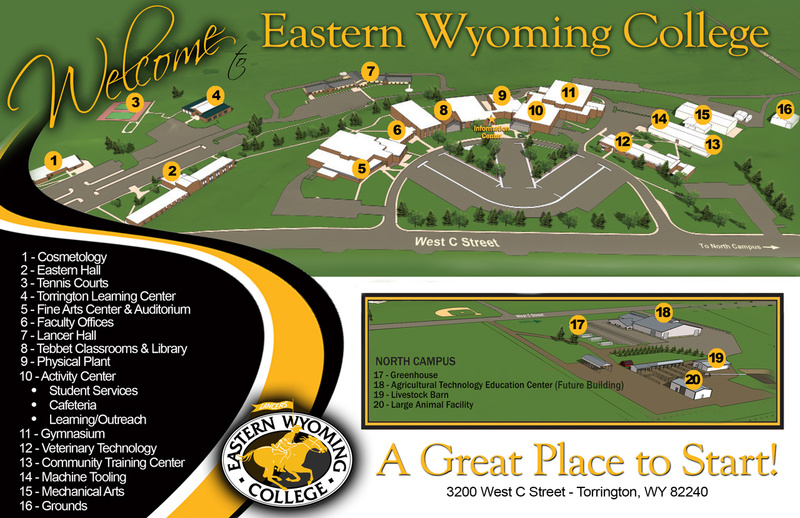 Eastern Wyoming College is pleased to announce the honor rolls for the Fall 2011 semester. There were 260 students receiving recognition for achieving high scholastic grades. Completing the Free Application for Federal Student Aid is a vital step in getting help to pay for college. By attending FAFSA Frenzy on February 12th students and families can get free, expert help in filling out this important form. FAFSA Frenzy will take place from 1-4 p.m. February 12that Eastern Wyoming College in Torrington and at the EWC Branch Campus in Douglas. At the FAFSA Frenzy, financial-aid professionals — primarily from Wyoming postsecondary institutions — will provide assistance in completing the FAFSA. College-bound students must complete the FAFSA to qualify for federal and state financial aid, as well as scholarships and grants offered by many colleges, universities and vocational/technical schools. Students 23 years of age or younger should attend the FAFSA Frenzy with their parents or guardians and bring their parents’ and their own completed 2010 or 2011 Internal Revenue Service 1040 tax returns, if available, or W-2 Forms or other 2010 or 2011 income, asset and benefits information. If parents cannot attend, students may attend alone, but they must bring the same income information. Students 24 years of age or older may attend and bring their own completed 2010 or 2011 IRS 1040 tax returns, if available, or W-2 Forms or other 2011 income, asset and benefits information. For more information about the FAFSA Frenzy, call the number for your local site, for Torrington call (307) 532.8325 and for Douglas call (307) 358.5622. Eastern Wyoming College will be offering a wide variety of business and leadership classes that focus on the childcare industry. These sessions will be held over the Wyoming Equality Network (WEN Network) and will be available in Torrington, Douglas, Glenrock, Guernsey, Lusk, Moorcroft, Newcastle, and Wheatland. Participants may choose individual sessions or attend several sessions during the Saturday workshops. All presenters are STARS certified and workshops have been approved for providers seeking STARS training credits. Classes are $10 per session which includes the class and all materials. To register please call Janan McCreery at 307.575.3553 or email her at janan.mccreery@ewc.wy.edu.